With Lake Geneva and the Alps on the horizon, what better place to recharge your batteries than the Spa at the Hôtel Royal, in Evian-les-Bains. 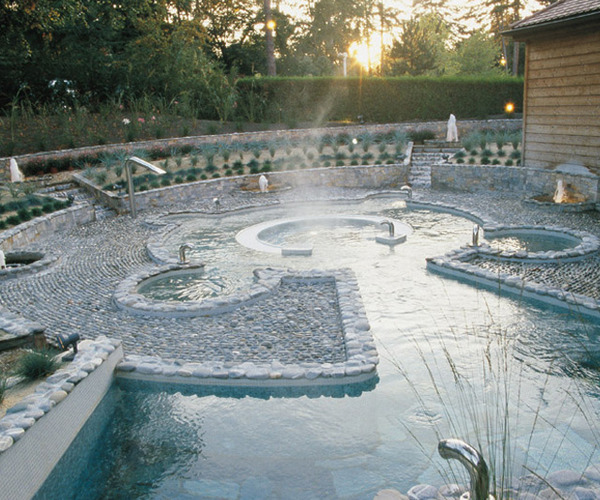 Spa Evian Source draws its energy from its magnificent setting and its rich historical past. Soak up its infinite purity and peace. Our highly professional and enthusiastic teams are happy to share with you its delightful atmosphere. Hotel Royal offers treatments to procure feelings of balance and beauty and preserve, on an on-going basis, your youth and vitality. Treat yourself to re-energisation, relaxation, physical activities, facial, body or hair treatments, a wide range of massages, sports sessions, wraps, peels, beauty treatments and a whole lot more, and spend a magical interlude with us. At the Spa Evian Source, you can enjoy an indoor and outdoor pool, a steam room and sauna, an Aqua Gym Fitness Pool, 30 individual treatment booths, an LPG Endermolab room and a relaxation room. Also discover the benefits of the Hydro circuit: outdoors, surrounded by nature, follow a circuit through water with whirlpools, water currents and jets to exhilarate and invigorate. You can keep in shape in the fitness room and in our cardio and weight training room. We have sports coaches and trainers to advise you and support your fitness programme. Visit the Evian Resort Golf Club, and its fully renovated course, only a few minutes’ walk from the Royal and Ermitage hotels. This 18-hole championship course (6 595 yards, 72 par) is one of the most beautiful in Europe and offers magnificent views over the lake and mountains. Play golf on the course which hosts the famous Evian Championship (ex Evian Masters) women's golf tournament, which has been held in Evian every year since 1994, and taking place every year in September. Following complete renovation in 2013 the course now offers a new way to play golf whilst retaining a strong “French” identity. All of the greens have been altered while five holes have been totally redesigned to create a top-level course. 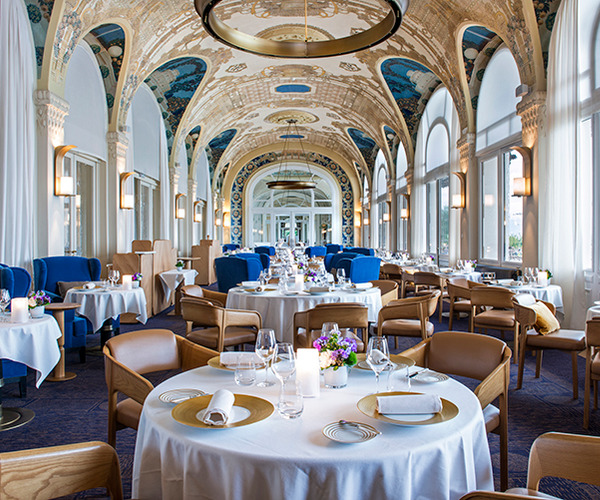 Les Fresques restaurant in Evian is the Evian Resort's high-end restaurant, offering a stylish, contemporary setting. Chef Patrice VANDER and his team serve creative, sophisticated cuisine made using outstanding ingredients. The menu is graced by a number of classic dishes such as wild sea bream marinated with mango, wakame and Oscietra caviar or Bresse chicken breast studded with foie gras, with fines herbes and yellow wine. Finally, come and sample our "collection dishes" such as crayfish from Lake Geneva, in a foie gras royale, froth perfumed with saffron from Marin, or Arctic char from the lake, cooked menuière and served with Sault spelt wheat, in the style of a risotto. Room options include: Belle Epoque Suite, President Suite with views over Lake Geneva, in Evian, Exclusive Président Suite at Evian-les-Bains – Lake Geneva view and Edouard VII Suite with panoramic view over Lake Geneva, Royal Suite.